From the new CURV Collection. The world's first curved chronograph movement features high- performance quartz technology with 262 kHz vibrational frequency for +/- 10 seconds per year precise accuracy. Five-hand chronograph in gunmetal stainless steel case and rose gold-tone bezel, dark grey dial with red accents, curved sapphire glass, gunmetal stainless steel bracelet with double-press deployant closure, and water resistance to 30 metres. 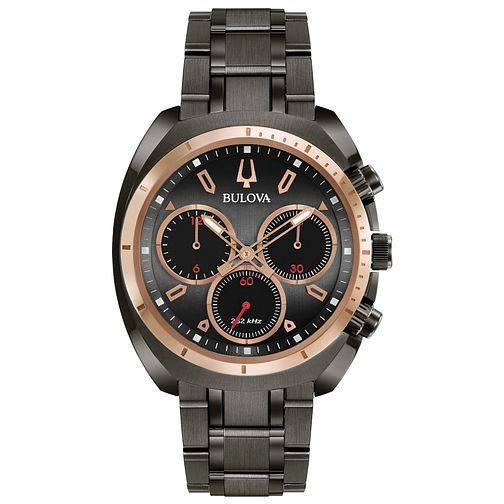 Bulova Men's Curv Chronograph Stainless Steel Bracelet Watch is rated 4.7 out of 5 by 3.